Kat - Also at the Genetics Society autumn meeting, we were treated to a lecture from Cambridge University's Elizabeth Murchison, winner of the society's 2014 Balfour Prize. She works on two unusual cancers: Tasmanian devil facial tumours, and CTVT - canine transmissible venereal tumours. But unlike all other cancers we know of, these diseases are contagious and can be transferred between animals. And unfortunately for Tasmanian devils, it could be driving them to extinction. I asked her to tell me the story. Elizabeth - We normally think of cancer as a disease that arises when a cell in our body acquires mutations that causes it to grow into a tumour and sometimes that can spread inside the body. However, we normally think that cancer doesn't survive beyond the body of its hosts. So, these two cancers in dogs and in Tasmanian devils have actually acquired adaptations which have allowed them to survive beyond the deaths of the original dog and devil that first gave rise to them and to spread through the population as a transmissible cancer. Kat - It sounds like pretty scary stuff. Elizabeth - It's pretty scary, yeah, and it's lucky that this has only happened twice that we know of in nature. But it's really a type of disease that we didn't really know much about previously. Kat - So, let's start with the devils. Tell me a little bit about the Tasmanian devils and this cancer that affects them and what you found out about it. Elizabeth - Yeah, so the Tasmanian devil is a carnivorous marsupial, actually, the largest living marsupial carnivore. It lives only in Tasmania which is just to the south of the mainland of Australia. 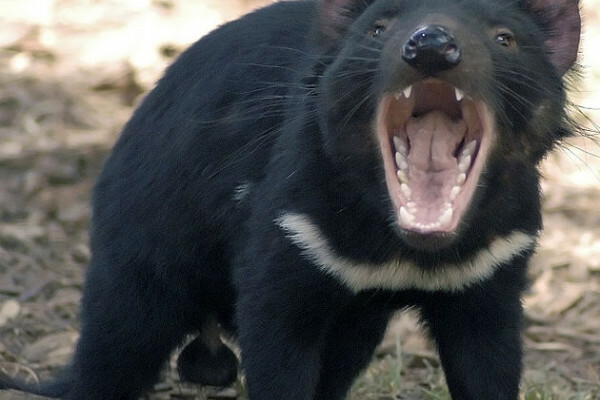 The Tasmanian devils are actually threatened with extinction due to the emergence of this transmissible cancer. The cancer was first observed in 1996 and since then it has spread rapidly through Tasmania and is now affecting, I think more than 60% of their habitat and it's caused massive population declines in the most severely affected areas. The disease is threatening to cause extinction of the species within only 20 to 30 years. So, it's a really serious situation for the devils. Kat - And seems quite strange for a disease that only appears to have emerged in the past couple of decades. Elizabeth - Yes, it's a highly virulent disease. It's spread by biting between devils. Devils get tumours on their face or inside their mouth. When they bite another devil, they actually physically implant the living cancer cells and somehow, they're able to escape the immune system and grow into a new tumour in that next devil. It seems to be highly transmissible and it causes death of affected devils within only a few months of the appearance of symptoms. So, it's a really nasty disease. Kat - How did people figure out that this was not just a virus that was being transmitted from devil to devil and was actually the cancer cells? Elizabeth - The key experiments came from looking at genetics actually. We found that the genetic patterns that you see in the DNA of the devil cancer are all very similar to other cancers and very different to the genetics of the hosts. So normally, if a cancer arises from a cell in the body, it would retain most of the genetic variants which are present within that person's normal DNA. What we see in the devil is that the cancer actually has genetic variants which are more similar to another devil than they are to the cancer zone host. So, it's really clear from the genetics that it's actually not arising from the devils carrying the cancer, but rather, where it's long time ago from a different devil and has spread this population by biting. Kat - This must be pretty exceptional cancer cells to be able to be transmitted and survive like this. What sort of things do we know about that enable them to survive and that they don't just get rejected by the new host's immune system? Elizabeth - Yeah. Well, this is a very good question because everything that we know about immunology suggests that transmissible cancers are impossible because they come from a different individual, they should be rejected. Somehow, the devil's immune system is not able to reject this cancer. This is a really active area of research. Hannah Siddle at the University of South Hampton has recently been doing very ground-breaking work where she's found that molecular markers which are normally expressed on the surface of all cells seem to be downregulated in devil cancer cells, meaning that the immune system doesn't really see the markers at all so is unable to grab on to anything. In a way, these cancer cells, they're kind of wearing an immune invisibility cloak because they're not expressing the correct markers. Kat - Given how rapidly the disease is spreading, how threatened the Tasmanian devils are now, are there any hopes realistically for something like a treatment or a vaccine or just to contain the disease? Elizabeth - Of course! Well, at the moment, there's a lot of effort going into captive breeding programmes. So, keeping devils alive and breeding in captivity, just in case the disease does cause extinction in the wild. And this is a really important programme and it's essential to try to keep devils alive and breeding even if they do disappear in the wild. Of course, we have a lot of hope that there will be eventually a vaccine or a cure for the disease or perhaps the devils themselves might acquire some resistance to the disease. But unfortunately at the moment, we still haven't got any of these things and it's something that we're really working on very hard. Kat - And now, to move from devils to dogs, tell me about the dog tumour that you've been working on? Elizabeth - Just like the devils, it's spread by the transfer of living cancer cells between dogs. But this dog cancer is actually sexually transmitted. So, the way that cells get transmitted is when dogs are mating with each other. The tumours which normally appear in the genitalia, tumour cells get transmitted from one dog to another. And in the same way as we've seen with the devils, these tumour cells somehow don't get rejected and have been able to spread in dogs. Actually, this tumour is now found all around the world. Free-roaming dogs which are mating randomly are the reservoir for the disease. So, this is why we don't see the disease normally in the UK. However, there are a number of cases of CTVT, this dog cancer in the UK in dogs which have been imported from abroad. From Romania for instance, there's often a number of cases seen from there. Kat - So, when you talk about the devil cancer that's a few decades old, what do we know about the age of this dog cancer and where it came from? Elizabeth - Well, as I mentioned, this dog cancer is found all around the world. So, that suggests that it must be quite old to have spread so widely. But we were interested in trying to use genetics to try to actually figure out how old it might be. What we did was to sequence the entire genome of this dog cancer and then to look at a type of mutation which is known to be acquired at a consistent rate throughout the lifetime of a cancer. Actually, this has been found in human cancers. Doing this, we were able to discover that this dog cancer may have first arisen in a dog that lived about 11,000 years ago. So, it's a pretty extraordinary cancer that it arose in that original dog 11,000 years ago. Rather than dying, when that dog died, its cancer is still alive today, having spread through the population of dogs by the transfer of cancer cells. Kat - How did it travel around the world? What do we know about its routes around the world? Elizabeth - It's a really fascinating question. We don't know exactly where that original dog lived. It could've been anywhere in the world. However, we know that it probably only spread around the world about 500 years ago. So, that original dog probably lived about 11,000 years ago. Probably, the cancer was confined in some area of the world - we don't know where - for most of its history. And then about 500 years ago, it seems to have escaped from there and spread widely around the world. 500 years is interesting because it's around the time of the age of exploration where seafarers were spreading globally much more rapidly. It's interesting to speculate that perhaps some people went to this place where CTVT first arose and took a dog from there and took it around the world and the tumour spread very rapidly. Kat - And the rest is genetic history. Kat - Do we know anything about what this original dog who originally had the cancer might have look like from its genetics? Elizabeth - If you think about it, the dog that first gave rise to CTVT, its genome, its DNA is actually still alive in the cancer that it gave rise to even though that dog itself probably died 11,000 years ago. So, we've been able to piece together what that original dog might have been like by looking at its DNA, the DNA of its cancer. We've been able to determine that probably, it was most closely related to a group of dogs known as the ancient breed dogs. These are dogs which have a more ancient genetic signature. They include the east Asian breeds like akitas and African breeds like basenji, and northern breeds like the Alaskan malamute, and the husky. We don't know exactly which breed it was most closely related to, but it's those types of dogs. In addition to that, we were able to look at specific genetic regions which are associated with certain traits in dogs like coat colour and morphology, and behaviour. We were able to determine that the dog that first got CTVT probably had an agouti coat which is a kind of browny greyish coloured coat. They probably had pointy ears, probably had a straight or wavy coat. We've been able to determine some of its potential behavioural characteristics. So for instance, it doesn't seem to have appeared to have had a higher risk of obsessive compulsive disorder. So, it's really interesting that we've been able to piece together what the dog was like from that cancer that it gave rise to. Kat - Obviously, the dog and the devil cancers seem pretty exceptional in the natural world, but are there any lessons we could take about cancer on a wider basis and also, is there a risk that these types of transmissible cancers could arise again? Elizabeth - Cancer itself is obviously quite common in humans and in other animals. It's interesting then to see that transmissible cancers are so rare. We only know of two of them in nature. So, that suggests that the process of going from being a cancer in one host to being a transmissible cancer which is spreading through the population is very unlikely to occur. I think understanding what changes of being acquired by the genomes of these two transmissible cancers in dogs and Tasmanian devils could potentially teach us a lot about how this process has come about. In addition I think though, studying transmissible cancers and the genetics of transmissible cancers does give us an opportunity to learn more about the evolution of cancers more generally, and how cancers interact with or escape the immune system more generally including in humans. Whether or not transmissible cancers could occur in humans, I think it's extremely unlikely because we've only seen transmissible cancers twice in nature ever. However, I guess it's a possibility we can't discount and it is certainly possible that it could occur one day in the future. Given that we know of two transmissible cancers in nature, it's highly likely in fact, almost certain that transmissible cancers have occurred many times in the evolutionary path, possibly also, caused the extinction of species in the past. However, I do think that probably, they have always been a rare occurrence and I guess it's going to be very difficult to prove that any particular species might have gone extinct because of a transmissible cancer. Kat - And finally, what next for you? What are you going to be looking at next? Elizabeth - My lab is very interested in understanding the evolution of transmissible cancers. So, what we're doing now is looking at the genetic changes that have occurred through the population of Tasmanian devil cancers and through the population of dog cancers to understand the mutations that have been acquired so that we can piece together the evolutionary path that these two cancers have taken in their journeys through their respective host populations. I think this is going to teach us a lot more about how cancers evolve in general and how cancers can escape the immune system and how cancers become transmissible. Kat - That was Elizabeth Murchison, from the University of Cambridge.